January 14, 2018 at 3:55 pm. PITTSBURGH — Leonard Fournette hates the cold. He hates losing even more. 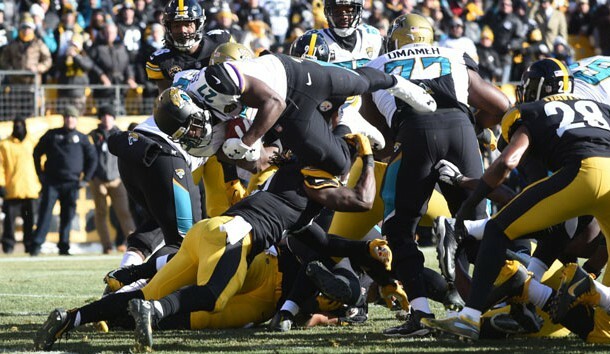 Fournette scored three touchdowns and rushed for 109 yards to pace the Jacksonville Jaguars to a 45-42 win over the Pittsburgh Steelers in an AFC divisional round playoff game Sunday at Heinz Field. It was the second time the Jaguars eliminated a Mike Tomlin-coached team from the playoffs and the second time the Jaguars defeated the Steelers this season. Fournette was dynamic in the first half before suffering an ankle injury after a reception late in the second quarter. He gained his 109 yards on 25 carries but had 82 yards and two touchdowns in a first half in which the Jaguars took leads of 21-0 and 28-7. The Steelers rallied to within 28-21, but were stopped on fourth-and-1 at the Jacksonville 39, and the Jaguars turned it into Fournette’s third touchdown. His 3-yard scoring run came one play after a 45-yard Blake Bortles bomb to Keelan Cole. Roethlisberger rallied the Steelers with a 43-yard touchdown pass to Antonio Brown on a fourth-and-5 play. Roethlisberger scrambled left and threw deep to Brown over cornerback A.J. Bouye to cut the deficit to 35-28 with 9:05 left. But the Jaguars answered with their sixth touchdown, a 14-yard, play-action pass from Bortles to wide-open fullback Tommy Bohanon that gave the Jaguars a 42-28 lead with 4:19 left. The Steelers scored again on a Roethlisberger lateral to Le’Veon Bell, who completed the 9-yard play with an 8-yard touchdown run with 2:18 remaining. But James O’Shaughnessy recovered the onside kick for the Jaguars with 2:17 remaining. Josh Lambo kicked a 45-yard field goal with 1:45 left to finish the Steelers, who scored on a 4-yard catch by JuJu Smith-Schuster with one second remaining. The output matched the Jaguars’ high for the season (45 vs. Houston). It was the most points the Steelers allowed since the New England Patriots scored 55 against them in 2013. The NFL sacks leaders with one more than the Jaguars, the Steelers didn’t sack Bortles, nor force a turnover in their elimination game. The Jaguars didn’t waste time getting on the board. Bortles directed them 66 yards in eight plays off the opening kickoff. Fournette dived 2 yards over the top on fourth down for a 7-0 lead. Two possessions later, following a Myles Jack interception, Fournette dashed 18 yards through the left side of the Steelers’ defense for his second touchdown and a 14-0 first-quarter lead. T.J. Yeldon scored the next touchdown on a 4-yard run that capped the Jaguars’ fourth possession. After stuffing Bell for a 4-yard loss on fourth-and-1, the Jaguars drove 75 yards in 11 plays to set up Yeldon’s run for a stunning 21-0 lead with 11:31 left in the first half. The Steelers scored when Brown caught a 23-yard touchdown pass from Roethlisberger over Bouye in the corner of the end zone. With 8:20 left in the first half, the Steelers trailed by 21-7. Fournette injured his ankle after catching a 10-yard pass, but without Fournette the Jaguars turned to their defense. A fumble by Roethlisberger, off a Yannick Ngakoue sack, was scooped up by linebacker Telvin Smith and returned 50 yards for a touchdown. The third defensive touchdown of the season by Smith gave Jacksonville a 28-7 lead with 2:20 left in the first half. The Steelers answered with a fourth-and-11 bomb that sailed over the head of Brown and into the arms of Martavis Bryant, who came over from the other side of the field to haul in the 36-yard touchdown pass and set the halftime score at 28-14. The Steelers cut the lead to 28-21 with a 19-yard touchdown pass to Bell on their first possession of the second half. On third-and-9, Bell ran a wheel route out of the backfield and caught Roethlisberger’s pass over the head of Smith. Bortles completed 14-of-26 passes for 214 yards and one touchdown. Roethlisberger completed 37 of 58 passes for 469 yards and five touchdowns. He was intercepted once and fumbled once. Brown led Steelers receivers with 132 yards on seven catches. Tight end Vance McDonald caught 10 passes for 112 yards. Smith led the Jaguars’ defense with 16 tackles (14 unassisted) and the fumble return for a touchdown. NOTES: Jaguars WR Marqise Lee left in the first series with a foot injury, but returned on the next series. … Steelers RT Marcus Gilbert left with a concussion suffered on the fourth-and-1 run by RB Le’Veon Bell that lost 4 yards. He was replaced by Chris Hubbard for the remainder of the game. … Steelers ILB Vince Williams and KR Fitzgerald Toussaint left in the second quarter with concussions, but both returned. … Jaguars FS Tashaun Gibson left with a foot injury in the third quarter. He was replaced the remainder of the game by Jarrod Wilson. … Jaguars DE Dante Fowler Jr. left with a shoulder injury early in the fourth quarter. He was replaced for the remainder of the game by Lerentee McCray.